that truly become part of your home and everyday life. Cape Cod is the ideal locale to expand outdoor living spaces that bring family and friends together! The perfect deck or porch allows you to enjoy the nine months of wonderful weather or a sunroom can be designed to get that outdoor feel and yet allow year-round use. Beginning your outdoor living project planning with design, planned usage and parameters of your current property in mind is where our experience can truly help. Researching or creating a current plot plan, determining setbacks and exact location of your septic is one of the first steps in deciding the perimeters of your new space. Our experience in this area with our unlimited license, surveyors and engineers on staff can be invaluable to making sure you are receiving the correct information long before planning the construction. Thinking through how your expansion connects to your current home to allow easy flow and accomplish the use you envision is of paramount importance. You may want to consider the sun’s position at different times of day as you picture sipping your morning coffee or an evening glass of wine. We can help you design your new space to fit into the style of your home and your existing landscaping or you may want to incorporate new landscaping as part of your plan. Whatever your needs, Ranney + Rimington can accomplish it. 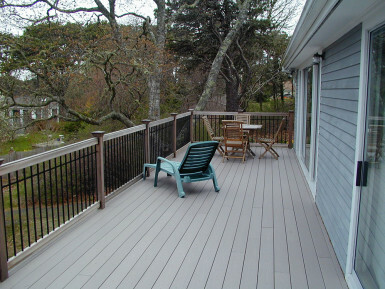 Your new deck can be constructed with durable, attractive and cost effective pressure treat materials or with all composite material that need no maintenance over the years and adds usefulness and value to the property. Mahogany is also a very attractive and popular option for decking. Railing systems choices include basic pressure treated construction, composite or even glass or cable. There are nearly endless options of deck design form the simple single deck off the kitchen or dining room to multi-level spaces that connect to hot tubs or pools or have walkways leading to other parts of your property. 2nd floor decks or balconies can also be constructed to allow outdoor access off of bedrooms or even a roof top platform. A sunroom or three-season room is the perfect place to relax out of the sun (and away from insects if they are screened) while enjoying the sounds and smells of nature around you while keeping your indoor living space separate, but easily accessible through glass doors. Many of our three season sunroom designs are constructed with easy all-season, full living space conversion in mind. A great place to kick back and enjoy anytime of the day or night in a relaxed vacation-like setting. With any outdoor space you will want to consider including an outdoor rinse station or shower, it is a huge plus for Cape Cod Summers. 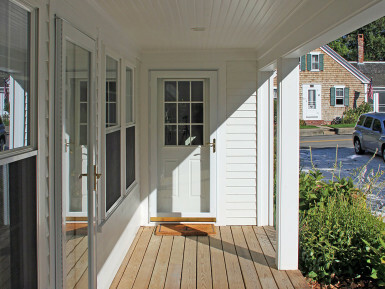 A front porch with a possible vestibule can add dimension and depth to the look of your home. An entry mud room with built-in coat storage or bench to take off your boots or shoes makes year round living more comfortable in the winter months. A wrap-around farmer’s porch with a well-designed roof line can completely transform the look of a simple ranch or colonial.